Learn to make one of the easiest pies you’ll ever bake! Every lemon pie I’ve ever tried has been immediately declared my favorite, so today I’m sharing my favorite for this moment in my life. You are going to be stunned at how little time it takes to mix up this pie. Seriously, don’t blink or you’ll miss it. In addition to using ingredients you probably already have on hand, this pie also makes its own crust, part of the “Bisquick Impossible Pie” craze of the seventies, back when the latest technology was a walkman cassette player – and everyone who owned a cassette became a master surgeon at getting the “guts” back in with a pencil when it got hung up. Cassettes may be out but this pie is one that has stood the test of time, just sweet enough with a nice eggy texture to it somewhat reminiscent of a chess pie (I’ll put links to my chess pie recipes at the bottom of this post). It’s a sure bet to add to your files. If you want to jump right to the recipe, just scroll down to the printable recipe card. If you’ve got the time and inclination to visit a bit, keep reading. It’s always remarkable, as your kids grow up, to see who they have become. My Katy is so much like myself in ways I never expected, but she is uniquely her own in many more ways – and the longer I know her the more of a fan I become. It’s an amazing Creator that allows us to raise our best friend and I can’t wait to see where her life takes her. I’m so glad we had this weekend. 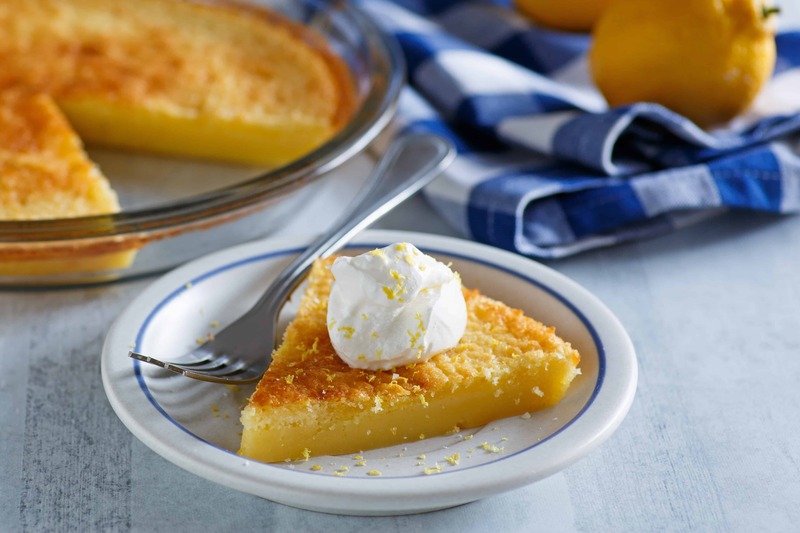 Now we need some pie, lemon pie to be exact, because I am always ready to testify that lemon desserts are like eating sunshine and I don’t know a single person, especially in 2018, who couldn’t use a little extra boost of sunshine in their lives. I hope you get to make this soon, but more importantly, I hope you get to take that trip you’ve been thinking about with someone special to you. In fact, I’d love to hear about special trips you’ve made in the comments below! Spray 9 inch pie plate generously with cooking spray. Mix on low speed for three minutes. Pour into greased pie plate. Let rest for five minutes before placing in oven. Bake at 350 for forty minutes. Allow to cool before cutting. Refrigerate leftovers. May be served straight from the fridge if you prefer it chilled. To see the coconut version of this pie, click here. I LOVE impossible pies. And I LOVE lemon pies. What’s not to like about this!! I believe I have been waiting gor this a long time. Thank you so much. And just in time for my birthday this Sunday. You’re the greatest! HAPPY BIRTHDAY BEV!!!! My mother’s birthday is this Sunday as well!! I hope you have a wonderful day from start to finish!! Funny…before I got to the comments. I said I’m gonna make this for my 60th Birthday on Sunday. Just Me, Myself and I will enjoy this Lemon Pie. Plus Lemons are 99 cents a mesh bag right now. Win Win. Nancy, I hope you enjoy every bite of that pie and have a wonderfully fabulous 60th birthday!! My pie is done and looks picture perfect. I prefer chilled so it will be waiting for me at 12:01 a.m. “Officially my birthday”. Thank you for the birthday wishes! I’ll have to make this for my mom! She loves lemon more than I do! My sister in law took the whole family (11 of us total) on a Hawaiian cruise! It was a great trip! Maybe I should make her a pie too! Ps can you make this with a sugar replacement? OH WOW what an amazing family vacation!!!! She definitely deserves a pie, lol. 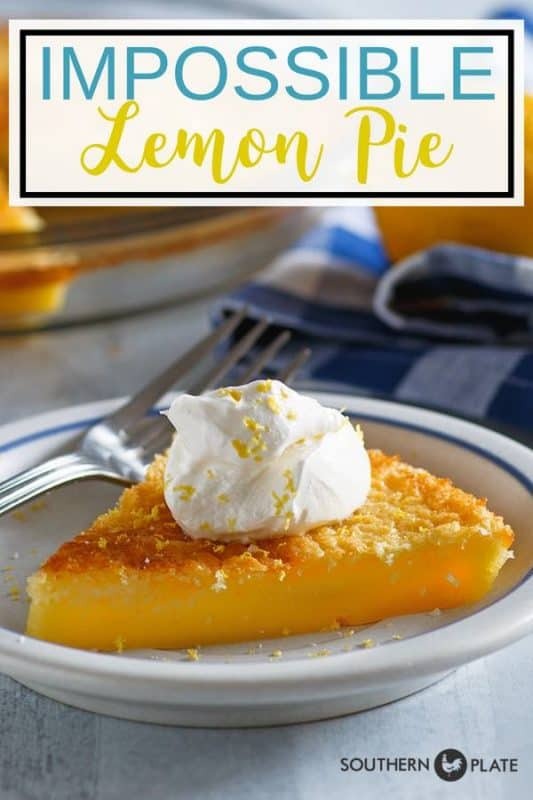 I think this would work really well with Splenda but make sure to measure it out light and fluffy rather than packed so it isn’t too sweet. I carried my grandson and his girlfriend to Helen a few weeks back. They went tubing and had a great time! We ate at Cowboys and Angels,also. I’m taking my niece and two great nieces to Pigeon Forge tomorrow for a couple days. I have been wanting to get back to Pigeon Forge. We usually go at least once or twice a year. Those folks tubing look like they were having so much fun but I’ve learned my lesson about adventures while on vacation, lol. What was the name of the place you stayed? I want to take my family there. Hey Melanie! We stayed at the Helendorf Inn. It is right in the middle of everything so you’ll park your car and never need it until it’s time to go home. This post touched my heart. Your relationship with your daughter reminds me so much of what I had with my own mom. Unfortunately I lost her to Lupus almost 11 years ago, but each of our girl trips still bring me so many sweet, cherished memories. Now I make it a mission to try and make my daughters’ childhoods just as special, as you are, my friend. I can’t wait to try this pie recipe with them. Thank you for a walk down my own memory lane. Crystal, thank you so much for taking time to share your heart. My own heart is aching for you but knowing your precious Mama is so proud of the Mama that you are. Sending you hugs from Alabama sweet friend. 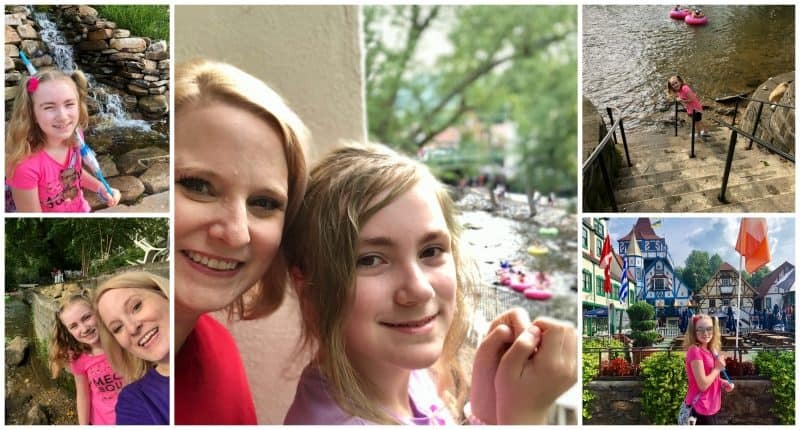 My sister and I travel together and have such a good time – we have so many great memories! We just got back from a week in Boston. 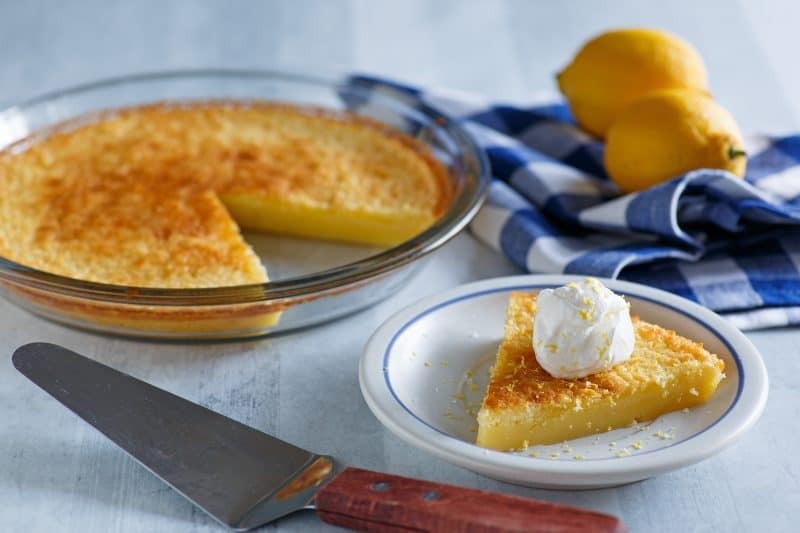 The lemon pie looks delicious – I can’t wait to try it. Our extended family went to Branson for a week. It was amazing to spend quality time with each of my nieces and nephews. They always amaze me with how much they have changed. The eldest is so “grown up”, and the youngest is such a good reader. The pouty one is now open and talkative, and the wild child is…well, still wild. There’s still hope for him yet! Family is the foundation of everything. Enjoy time with them every chance you get. It always lifts my spirits and creates memories to sustain me during the rough patches. Ga. I want to go there. Where did you stay? We stayed at the Helendorf Inn. It was just steps away from everything so walking was easy peasy. That coconut one is my weakness! We love Impossible Pies. Hubby makes them. He will really enjoy this one. We have been to Helen many, many times. We lived in Germany for a few years and we were so glad to find this little wonder tucked in the mountains. Oh wow! What a rich experience to get to live there for a bit! We really enjoyed the more authentic German spots tucked into the nooks and crannies. 🙂 What is your favorite Impossible Pie? Do you think reducing the sugar would affect anything more than how sweet it is? It may make it a little runnier but not if you just reduced it by a little. I was lucky to go on several mother/daughter trips with my mom, way back in the ’80s. We both loved books, so we would hit up the Yellow Pages in our hotel room (this was way before Internet). We’d search out bookstores and out OTHER love, flea markets. We had such fun finding the places in unfamiliar towns. I remember we got lost in St. Louis and ended up in a not-so-desirable part of town and she said “Roll the windows up and lock the doors.” LOL! Our trips included Boaz, AL for the outlet shopping, St. Louis, Louisville & Lexington, KY and Atlanta, Augusta GA. Sadly, we lost her in 1992 to lung cancer. She would have LOVED the internet and I’m sure would have been a Facebook junkie! As for the pie, it looks scrumptious. My favorite lemon pie is the lemon ice box with meringue. Like others, my mom and I loved to travel together! We visited Helen which was so laid-back, just what we needed! We enjoyed other places in that area also; Warm Springs, GA at a B&B and Gatlinburg during the holidays. Although she’s been gone many years I treasure those memories. Could I use a food processor instead of a blender? Any baking mix will work. I am sure there are even some homemade versions out there as well. More custard tasting than lemon. I squeezed real lemons, too. Still tasted great, but if you are looking to make a lemon pie, this wouldn’t be it. I can’t wait to make this pie on Monday my daughters and my weekly dinner night. We just got back from a cruise to Cuba and had a ball. WE are such good travel buddies. My are looking forward to our next adventure.